We are very excited about this weekend! Make sure you pick up your race packets on Thursday or Friday. You will not be able to do so on Saturday. For those of you who don’t know, Ingram has decided to run the 5k. So if you want to run with him or if you can get to the Team Ingram Tent to root him on, he’s going to need the boost! Once he finishes, we will all come back to the tent to cheer for the half- and full-marathoners. We will have a tent at Monroe and Danny Thomas. The 5k and half-marathon will pass by us right before the finish line. The full marathon will pass within 100 yards twice. It is within easy walking distance of the starting line so you can watch your runner start, then walk up to the tent and wait for them to come down the finishing stretch. It is also a good meeting point for runners and families for after the race – 200 yards from the finish line. And we hope you’ll make a lot of noise at the tent! We are completely exhausted and it's only the beginning of the month already! 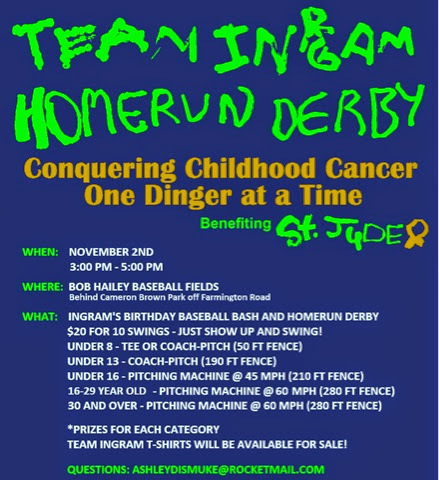 Ingram's Birthday Baseball Bash and Home Run Derby was AWESOME!!!!! It's a good thing we have a whole month to get ready for "marathon weekend" or we'd probably sleep through it I'm sure. 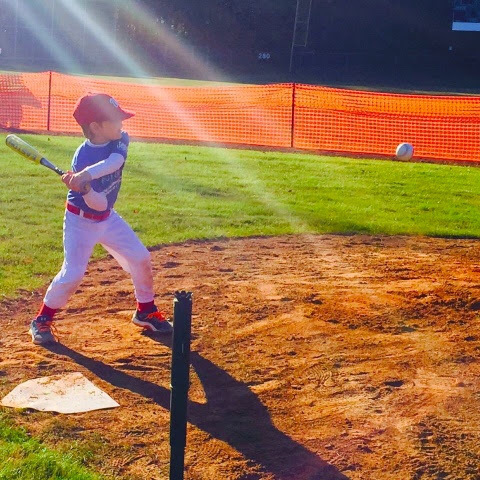 We had almost 150 batters taking swings and over 400 people that were at the ball fields cheering them on and helping pull Ingram's long awaited baseball party off! We could not have done it without the City Of Germantown (who gave us the fields for the day) and the hundreds of folks that helped in every aspect of the event. We had baseball teams that cancelled their practices and sent their teams to the Derby to help and hit, Madison and Lindsey's friends all came out and volunteered at different spots form the fields to the concession stand to running scores/names to the announcer who entertained everyone the whole 2 hours with music and talking about each batter as they were at the plate. ECS sent their baseball and softball team out to help and there were several Briarcrest, Collierville, and Houston players at the fields too. Overall it was a great day with beautiful weather (until the sun went down) and we were able to raise $5,750 for St. Jude Children's Research Hospital in only 2 hours!!! So many people asked if were were going to do it again next year, and the answer is YES...we'll just move it to the end of September/early October so it's closer to Ingram's actual birthday and might even be a little warmer once the sun goes down too! Hopefully these pictures can help show how much fun we all had! Ingram Getting His Homerun On! We'll Just Call This Chaos! And We'll Call These Boys TROUBLE!!! 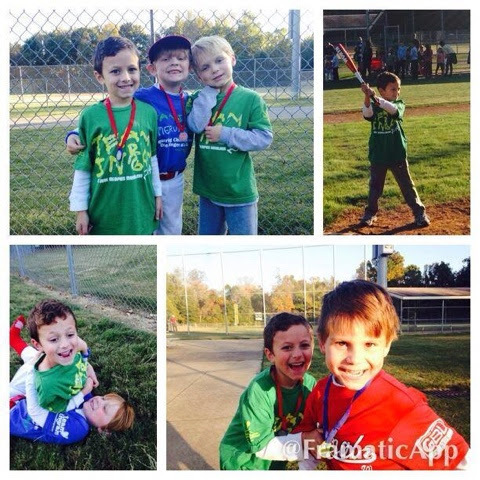 This Is A Mixture Of Ingram's Buddies From ECS, Dogwood, And Preschool! 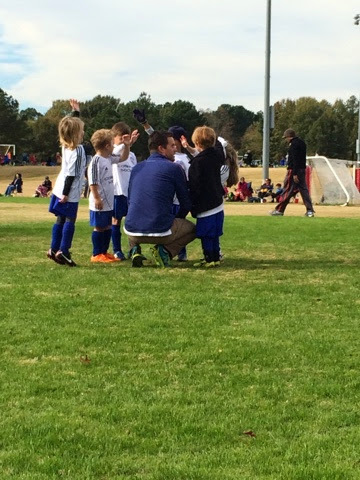 Getting Kids Lined Up On the "Under 8" Field! It's Kinda Like Herding Wild Horses! The Weather Was Sooooo Nice While It Was Daytime! These Pictures Don't Show How Crowded It Really Was! Evangelical Christian School, And Dogwood Elementary School! Our Announcer And Entertainer Extraordinaire...Mr. Shad Berry! More Chaos Down At The "Little" Field! "The Running Of The Kids!" Brenlin And Jeb Are Full Of Smiles!! And Mrs. Booten And Tons Of Other Families! The Boys Taking Charge Of The 9-12 Year Old Field! Daniel, Jack, And Ben Talking Strategy! And Germantown Baptist Church Preschool Represented By Mrs. Litvan and Mrs. "O'Connell"
But Of Course Ingram Calls Then Nolan And Harrison's Moms! For An Hour On The Interstate To Get Here! Madison Attempting To Hit The Ball...Craig Says She Takes After Me For Some Reason! And He's Taking Full Credit For Lindsey's Swing! Craig Watching "Heaters" Fly Right By His Face From Bill Edwards, Former Pitcher For The Angels! He Finally Hit One And It Was Solid, But No Homerun! Even Pops Got In On The Action! He Had More Hits Than Craig I Believe, But No Homers Either! Guess He's Not Too Old After All! Getting Ready To Announce The Winners! Want To Give Him The Trophy Or The Gift Card From Academy! Ingram And Jack...Winner Of The 9-12 Division In A "Sudden Death Hit-Off!" Ingram With One Of "His ECS Guys" That Won The Under 16 Division! Ingram With Bill Edwards And His Son...He Won The Over 30 Division! Even after an amazing day of baseball, Ingram still had enough energy that he wanted to try and run a mile...make that two miles. 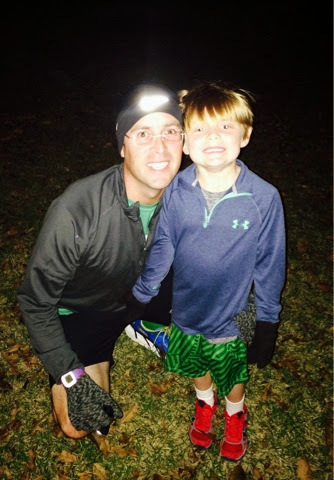 Ingram and Daddy ran t mile in just 24 minutes!! 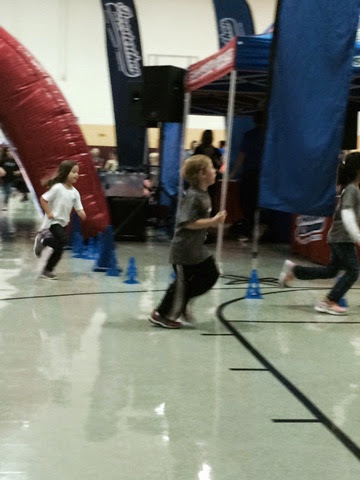 Guess he's really serious about running the 5K for St. Jude next month! It Must Be The Red Shoes! He Said They Were Super Fast When He Was Trying Them On At The Store! 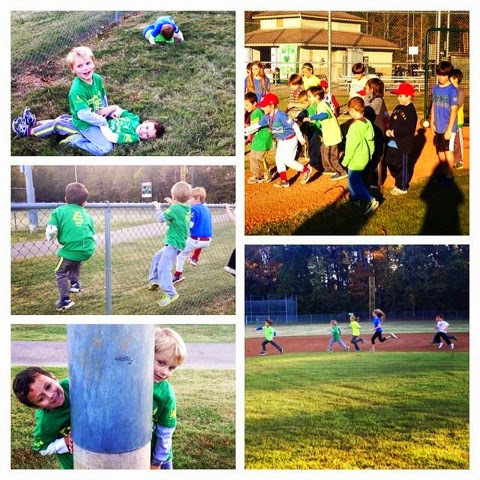 Not only was he preparing for the 5K, but he was also getting ready for a Boosterthon Fun Run at his school. The weather got really nasty and the field was wet so they decided to run it in the gym. It was a super fun morning and Ingram was definitely getting his move on! 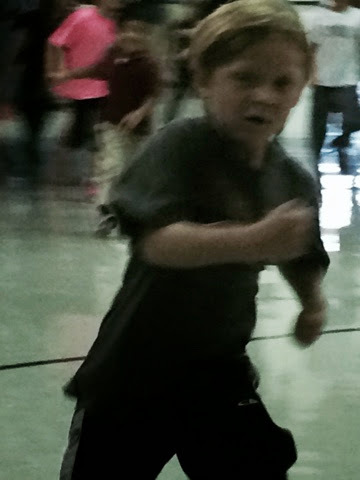 He ran 35 laps in the gym and made sure to come in for a speedy close up every few laps. Too Busy For A Smile This Round! 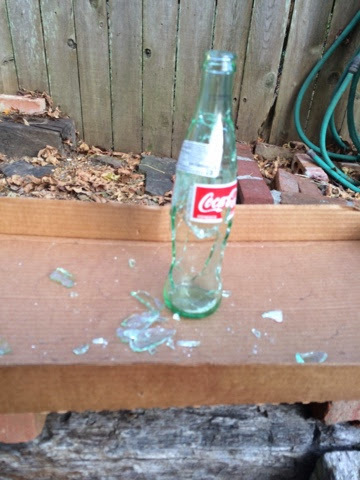 And Now He's Too Fast For A Picture! 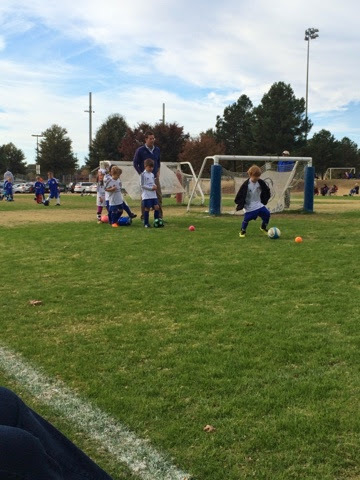 Since Ingram loves playing sports and being outside, soccer has been fantastic these past few months. But today it was "the best day ever" according to Ingram! Ingram's coach was out of town and he asked Daddy to coach the kids and Ingram was soooo excited. It was also the first cold day but there was plenty of moving around on the field to keep these little munchkins warm. Doing A Little Dribbling Around The Cones Or I Guess You Could Say Around The Wiffle Balls! Craig..."Who Wants To Start First Since There Can Only Be Three Of You On The Field?" All Six Kids..."Me Me Me!" It Was Definitely A Fun Day!! Another thing that's great about November is that the "Thanks And Giving" Campaign begins and runs through the end of December! 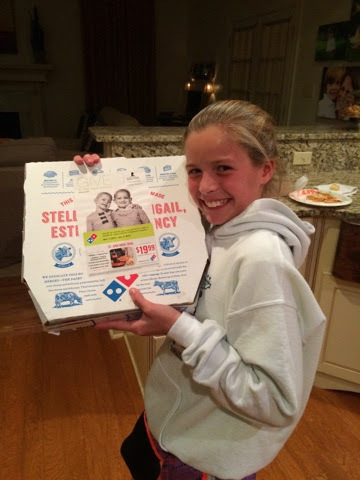 There are so many companies that are involved in donating money to St. Jude and it's so easy to make a donation...even if you're just eating dinner! 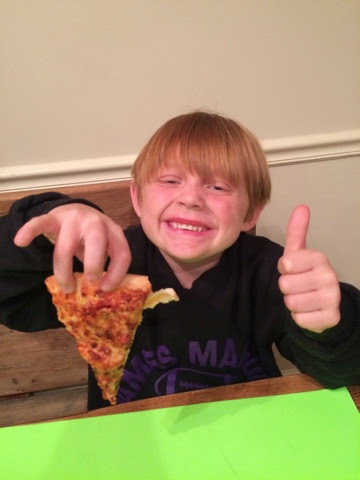 Dinner And Donation Approved By Ingram! And Lindsey Would Eat Dominos Everyday If Given The Chance! 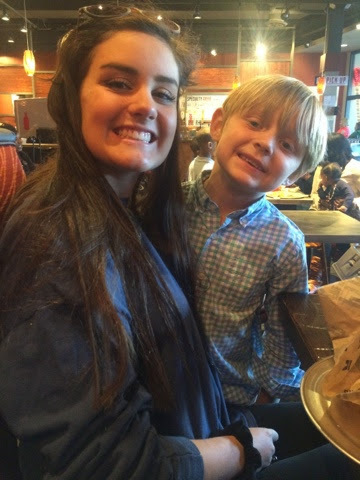 And talking about St. Jude, guess who we ran into at lunch one Sunday after church? It's Ally, Ingram's ependymoma twin. It was so fun to catch up with her and hear all about her school and cheer/dance accomplishments! One of the perks of not being in treatment is having hair. We LOVE Ingram's hair and talk about when he was "balded" all the time. He seldom gets haircuts and most of the time it's Daddy trimming him in our bathroom with our kitchen scissors. I know that's awful right?, but his hair is special and is kinda his thing. 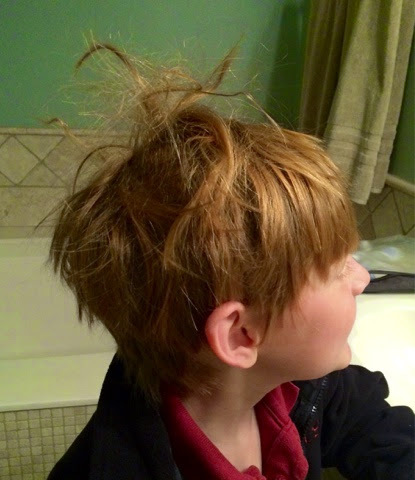 And then there are days when he wakes up like this and there is absolutely nothing I can do to his hair to make it look normal! 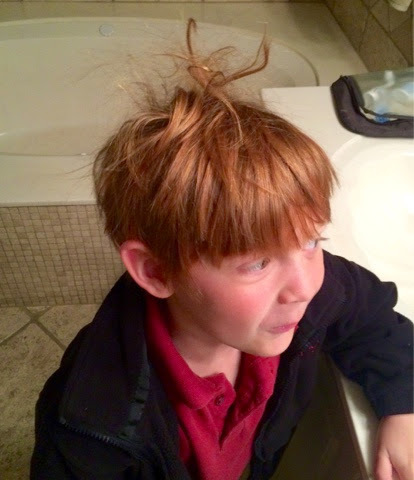 Those are the days that are the best...funny hair days because Ingram is around to have crazy hair days and I realize he is nothing like normal...he's extraordinary! 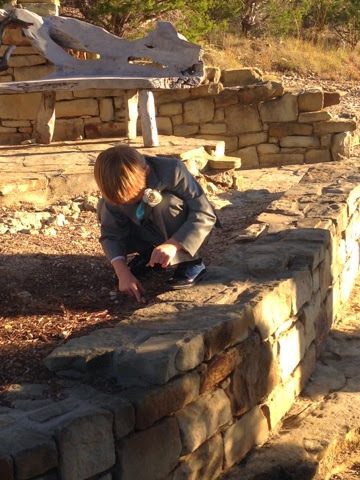 Just Working On A LIttle Hand/Eye Coordination With His BB Gun! I'm Sure Our SJ Eye Doctor And Our SJ Occupational Therapist Would Approve! At Ingram's insistence, Daddy and the girls have been "training" with Ingram to see if he could run in the St. Jude 5K in December. He's only six years old and doesn't always have energy that lasts so we didn't want to sign him up if he wasn't ready to run. They have gone on runs for a block, for a mile, for a mile and a half, and for two miles, but today was by far his best run. 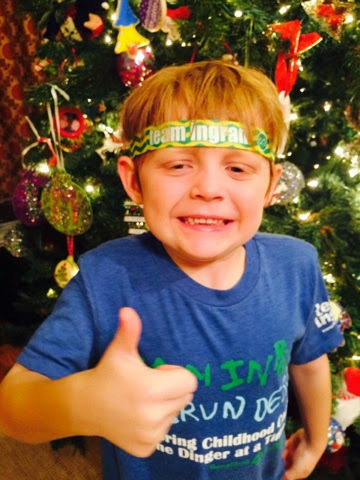 So if you're running at the St. Jude 5K Saturday December 6th, you may want to keep an eye out for this little dude...because he is officially signed up for the race! 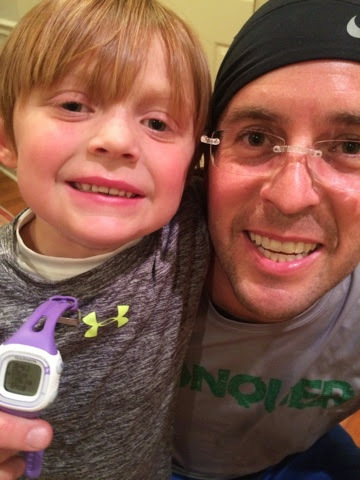 He ran three miles tonight with Daddy in 35:46! Watch Out...Here Comes The Conqueror! In case you didn't know, Ingram's also thinking about a career in the circus and practiced for it at Nolan's birthday party. 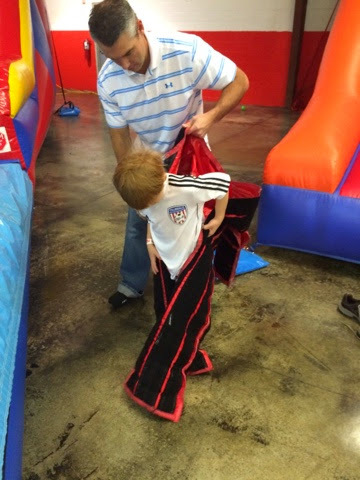 He wants to be "Velcro Man" and Nolan's dad Kevin was more than happy to help him with his ambition while we were at Nolan's birthday party! Yes, That Would Be A Velcro Suit! 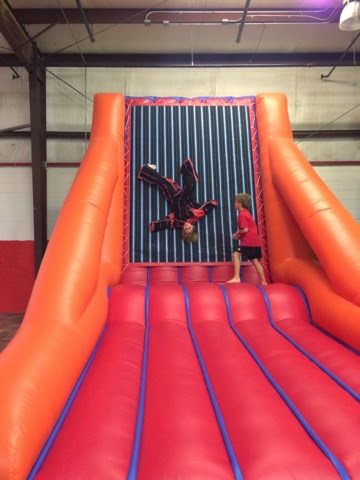 This Is A Video Of Ingram Being Stuck On A Velcro Wall! "Jacob, Stop Throwing Your Socks At Me!" 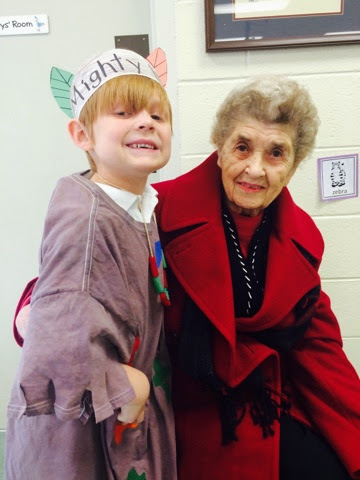 Back when Madison was in Kindergarten at ECS, she and the other kindergartners did a fun little Thanksgiving program and it was so cute. It's been 7 years since then, but the Kindergartners still do a Thanksgiving program and I think there was only one difference since she did it; they added a video of each student saying what they were thankful for on the big screen. When it was Ingram's turn on the screen, I had a whole mix of emotions and Thankfulness was on the top of my list! Before We Head Out On A Long Drive To Texas! 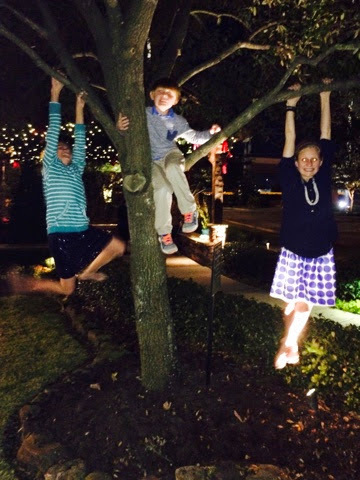 The Kids Were Able To Do A Little Monkeying Around At The Taste Of Texas! After our regular Thanksgiving dinner at G-mommy and G-daddy's house, we all drove to Austin for Aunt Leigh's wedding. Ingram kept saying that he hates weddings and didn't want to wear a tuxedo, but once he was dressed and ready, he was all smiles! 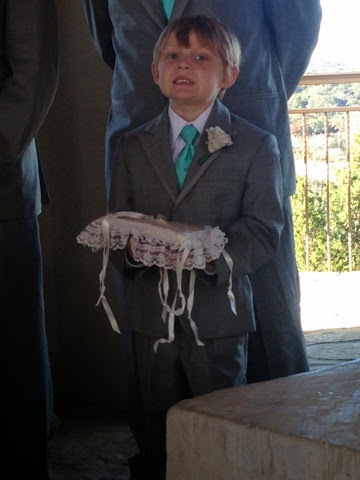 He even got a haircut from Aunt Leigh and it looked awesome; it was an outdoor, windy wedding and I promise his hair doesn't have gaps in it like the pictures show! 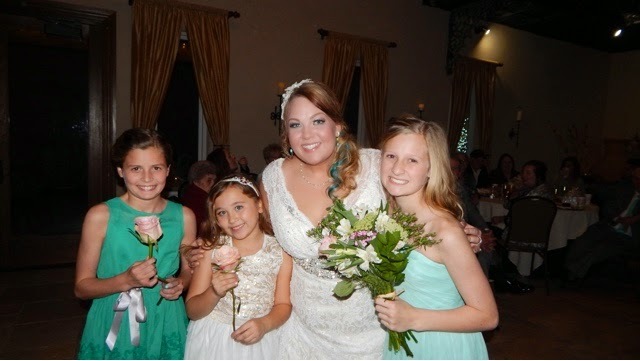 The wedding was simply beautiful and Leigh and Zach made it through without crying (for the most part). The kids behaved, the weather was great, and it was just a fun day to celebrate Aunt Leigh and be together as a family. 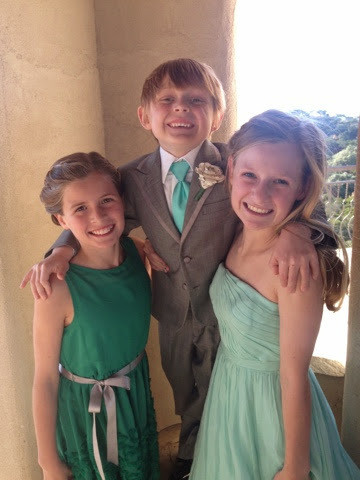 Junior Bridesmaids And The Ring Bearer Enjoying The Texas Sunshine During Aunt Leigh's Wedding! Well, Don't You Dig In The Dirt In Your Wedding Clothes? Ingram Getting His Move On At The Reception! 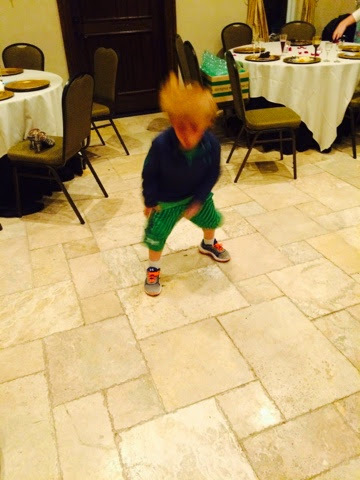 Even After He Changed Out Of His Tux At The End Of The Night, He Couldn't Quit Dancing! We made it back home and so did our brand new Team Ingram gear! 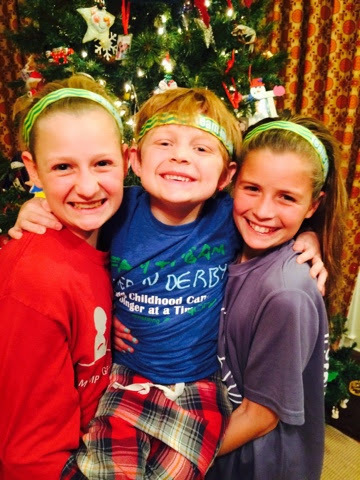 The kids are so excited about wearing their new custom made Sweaty Bands for the race and they tested them out to make sure they worked right! Custom Made TEAM INGRAM Sweatybands Help You Get Your Move On! THE Official Thumbs Up Approval! Ready To Conquer The 5K! We are officially ready for the race! Daddy, the girls, and Ingram will be running the 5K and I will be running the Half Marathon. 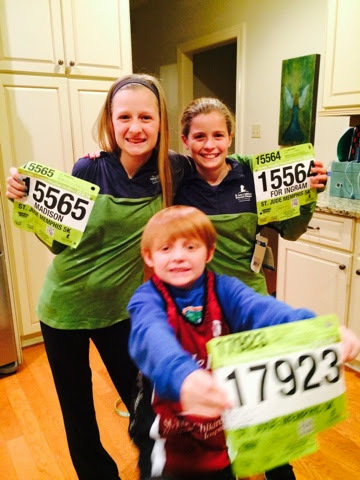 There are around 130 people on Team Ingram/Team Vining that will be wearing green during the 5K, Half Marathon, and Full Marathon and we'd love for you to be a part of the big day if you're in town. Our Team Ingram tent will be set up at Danny Thomas and Monroe Extended by the old Hostess Store as a meeting spot to cheer for all the runners in the race and to give everyone an energy boost to make it down the final stretch of each race. 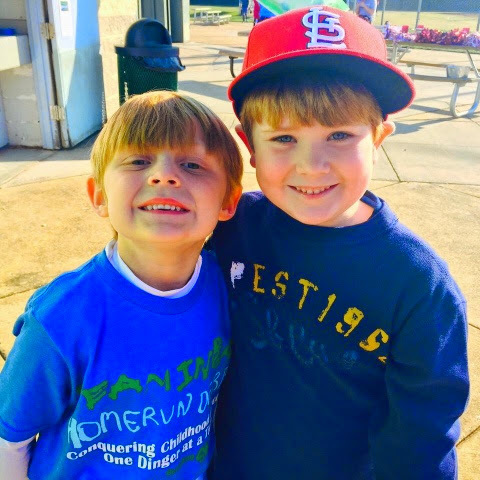 We hope to see all of you at the St. Jude Memphis Marathon Weekend and Ingram would love for you to come out and cheer him on during the final minutes of his first ever 5K! We all have so much to be thankful for...never in our wildest thoughts did we ever think we would be patients at St. Jude. 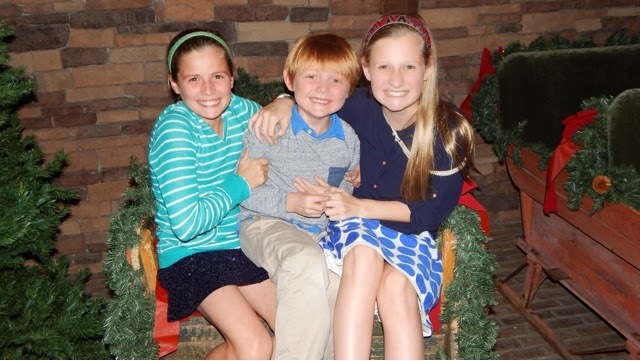 But we are part of the St. Jude family and we are thankful for how far Ingram has come with his treatment and we feel so honored to have so many people praying for our family and all the other families that are dealing with cancer. Please continue to pray for all the families affected by childhood cancer and for those that are struggling, especially during the holiday season.